Annie De Groot ’78's goal is to eradicate some of the world’s deadliest illnesses by making vaccines—and health care—available to everyone. Earlier this year, as Annie De Groot ’78 ushered a mix of the elderly, the immune-compromised, and the panicked along the snowy streets of Providence, Rhode Island, to receive the swine flu vaccine at a free health-care clinic, she remembered an experience as a young medical student working on vaccination campaigns in West Africa. De Groot’s experience as a researcher and a clinician, combined with her empathy for the forgotten and underserved, has made her uniquely suited to solving some of the world’s most intractable public-health problems. Since 1989, De Groot has received more than $26 million in funding for her research work from the National Institutes for Health (NIH). She’s been nationally recognized as a leading woman in science, having received the prestigious Eli Lilly Award from the National Foundation for Infectious Diseases, and she was named among the “best and brightest in science” by Esquire magazine. Recently, AIDS Project Rhode Island honored her for her work in West Africa. 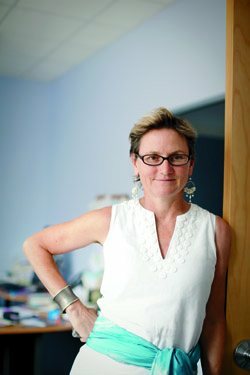 De Groot, who lives in Providence with her children, Xeon, 20, and Amanita, 16, splits the majority of her time between EpiVax, the biotech company she co-founded in 1998 with the tagline “Science without Fear,” and the University of Rhode Island’s Institute for Immunology and Informatics (I’Cubed), a research institute she was tapped to lead in February 2009. At the top of her priority list is the clinical development of the GAIA AIDS vaccine, a project she began conceptualizing in the early 1990s while still a research fellow. Unlike standard protective vaccines from the past century, which typically are made from either weakened or killed whole forms of a virus or bacteria, the GAIA vaccine contains epitopes. These highly selected pieces of HIV’s molecular structure are most likely to trigger a very specific immune response that protects the body from the virus. This is different from many of today’s “whole-killed” vaccines, which come with a risk of unwanted immune responses. What’s more, the GAIA vaccine has the unique potential to protect against all strains of the virus and at all stages of the pandemic, she says. Moving forward, she would like to see vaccines for a broad range of other illnesses, from tuberculosis to malaria, developed in the same way, with the idea of achieving social justice through medicine. “Access to health care, including vaccines, is a universal right that should not be limited by geography or circumstances of birth,” she says. At Smith, De Groot developed a love for anatomy, botany, and histology, along with a deep appreciation for the struggles women physicians faced early on. During her senior year, De Groot wrote a historical account of women and medicine and took a Five College course with renowned feminist and ethics scholar Janice Raymond, from whom De Groot first learned about the abuses of women in some medical practices. 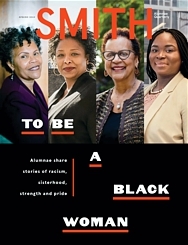 De Groot considers those Smith experiences as pivotal to her later success: “Smith gave me the freedom and confidence to explore topics that had a big impact on my medical career,” she says. A year after graduating from Smith, De Groot enrolled at the University of Chicago Pritzker School of Medicine. Following her residency in internal medicine at Tufts New England Medical Center in 1986, De Groot completed two three-year fellowships in immunoinformatics and infectious disease. She then joined Brown University’s medical faculty in 1992, and, armed with a grant from the NIH to jumpstart her research career, opened the school’s first HIV/TB research laboratory. Within her first year at Brown, she developed the epitope-mapping technology that today remains at the core of the GAIA AIDS vaccine. She was also outraged by what she calls the correctional system’s prejudicial and, at times, inhumane treatment of patients, which motivated her to launch the Infectious Diseases in Corrections Report, a forum for discussing how to best manage infectious diseases in the correctional setting. Although her outspokenness and advocacy sometimes got her into trouble—she was once escorted off prison grounds and told not to come back—she is widely credited for improving prison care for HIV and AIDS patients.